Please Note: The All American Pressure Canner 915 15 Quart is not recommended for canning fish. All American Pressure Canners are not recommended for use on glass top/ flat ranges without first checking with your stove manufacturer because their weight may cause the glass/ceramic to break. The diameter of the canners are larger than most burners and may cause heat to transfer outward and damage the surrounding surface. All American Pressure Canners are intended and manufactured solely for home use applications. they are not intended for commercial applications. 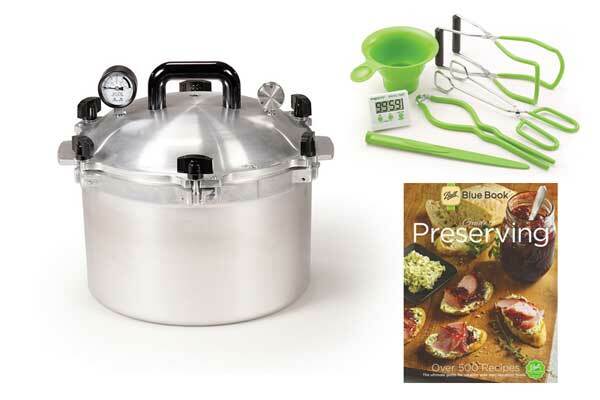 This Kit includes: the All American 15 Quart Pressure Canner, the Presto 7 Function Canning Kit, and the Ball Blue Book. **All American 15 Quart Pressure Canner- This 15 Quart, All American Pressure Canner great to use for canning, but it can also be used as a pressure cooker for days that you want to fix a quick meal. Only the All American canner/cookers feature an exclusive, precision machined metal to metal sealing system. No gaskets to crack, burn or replace. Easy on-off cover. Positive action clamping wing nuts permit easy open and close. Equipped with two automatic venting features, safety control valve, and overpressure plug. Extra heavy duty cast aluminum construction throughout for fast and even heating. Includes cooking canning rack and instructions. **Ball Blue Book- Guide to Home Canning, Freezing, & Dehydration. From the very basics to advanced techniques this book is sure to please everyone. Instructions, How-To's, Recipes, Lists, Charts, & much more. Theres no other book like the Ball Blue Book, the ultimate guide book for fresh preserving. 129 full color pages with full color photos. This is the classic American guide to keeping fresh tasting food on hand.